*Please note, childcare and translation services will be provided. Will your child be turning five between September 2, 2019 and March 31, 2020? Or, are you considering keeping your student out of kindergarten for an additional year? If so, please consider attending the Placentia-Yorba Linda Unified School District's (PYLUSD) Preppy K Parent Information Night on Thursday, January 17 at 6:00 p.m.
What is Preppy K/Transitional Kindergarten? Preppy K/Transitional Kindergarten is an early year kindergarten experience for children turning 5 years old between September 2, 2019 and March 31, 2020. Preppy K gives our youngest kindergartners an early start and provides them with the opportunity to learn and grow in an environment tailored to meet their academic and social-emotional needs. California passed “The Kindergarten Readiness Act” (SB 1381), that changes the age when children are eligible to enter kindergarten. Preppy K serves as a bridge between preschool and kindergarten and ensures that developmentally younger children are ready for kindergarten and beyond. Children may also enroll if their fifth birthday is on or before March 31. 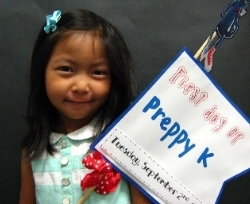 Preppy K represents a true bridge between preschool and traditional kindergarten. Taught by a credentialed teacher with early childhood expertise, Preppy K uses a unique, specialized curriculum that is based on the Common Core Kindergarten standards but is designed explicitly to support the social-emotional, physical, and academic needs of young five year olds. The Preppy K environment includes many opportunities for social-emotional development, fine- and gross-motor activities, and oral language development for all kinds of learners, including those with special needs. PYLUSD’s Preppy K program prioritizes purposeful, structured play, small-group instruction, and intentional teaching using hands-on, experiential activities. Preppy K truly provides our youngest Kindergartners with the gift of time, enabling all students to begin traditional kindergarten ready to thrive. For additional information please see Preppy K FAQs.